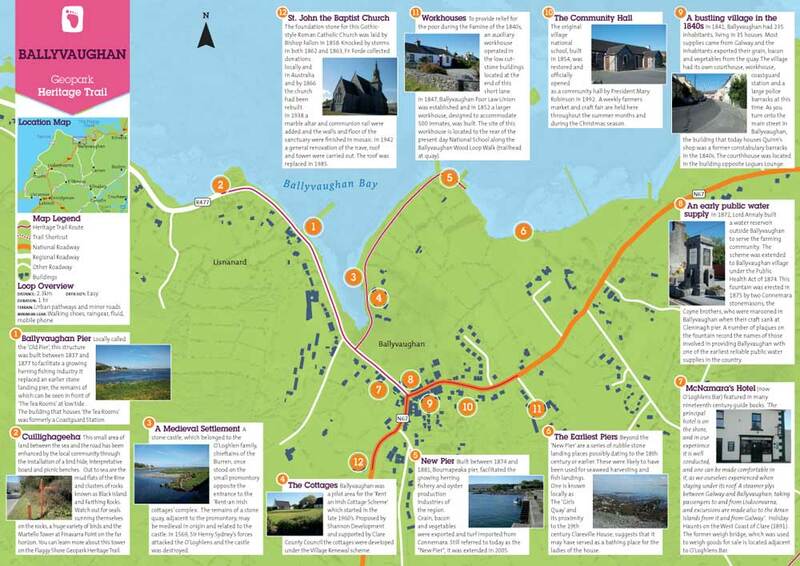 The Burren & Cliffs of Moher Geopark have developed a series of Heritage Trails in the Geopark region. 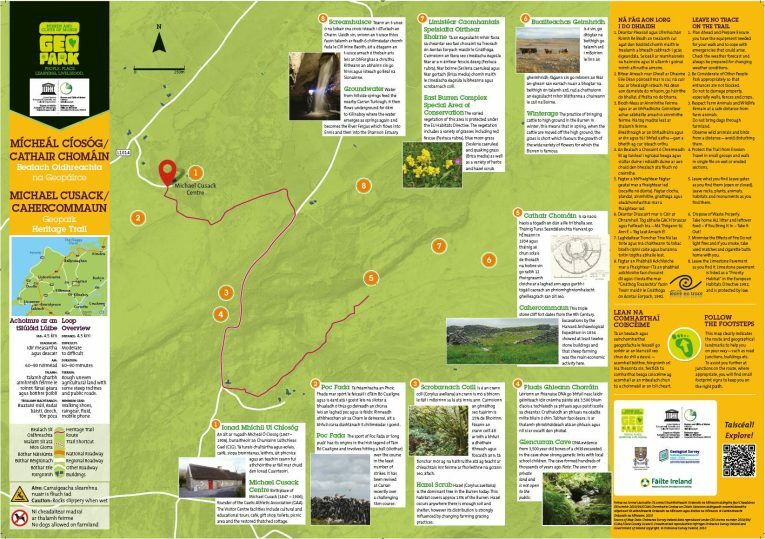 Each leaflet has a map and information on the points of interest along the route. The map clearly indicates the route and geographical landmarks to help you on your way – such as road junctions, buildings etc. As you follow the route you will see small footprint signs to help make sure you are on the right path. 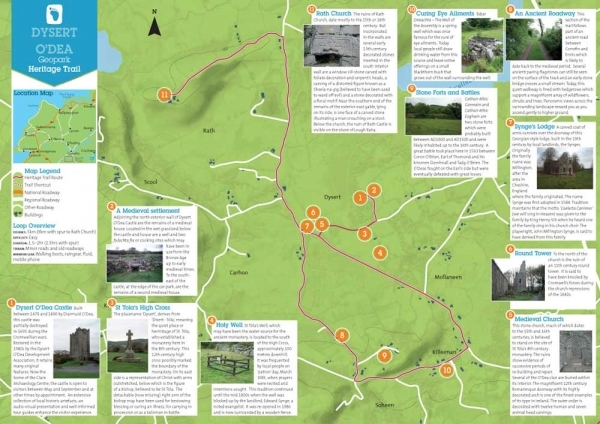 At the start of each trail you will find a trail head map, illustrating the walk and the sights to see on the way. 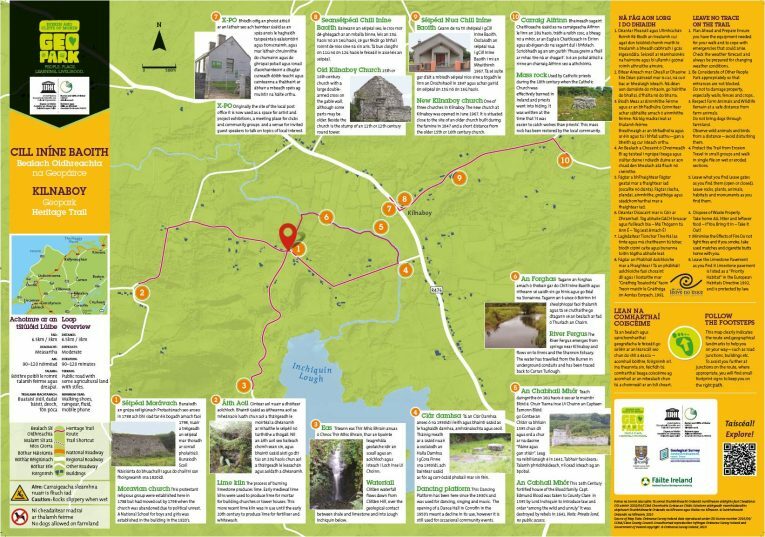 Maps of the Trails are available in Tourist information offices, select accommodations and visitor attractions. 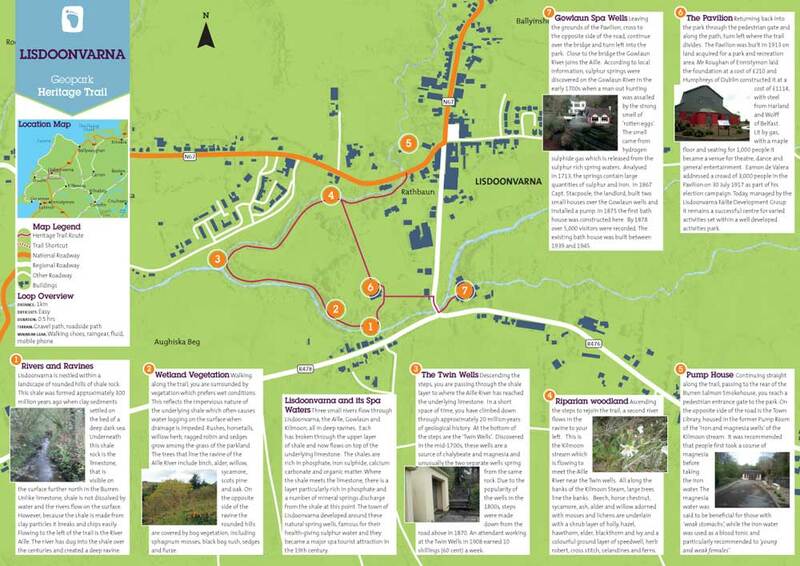 Below is an overview of each trail…. Locally called the ‘Old Pier’, this structure was built between 1837 and 1877 to facilitate a growing herring fishing industry. It replaced an earlier stone landing pier, the remains of which can be seen in front of ‘The Tea Rooms’ at low tide. The building that houses ‘the Tea Rooms’ was formerly a Coastguard Station. 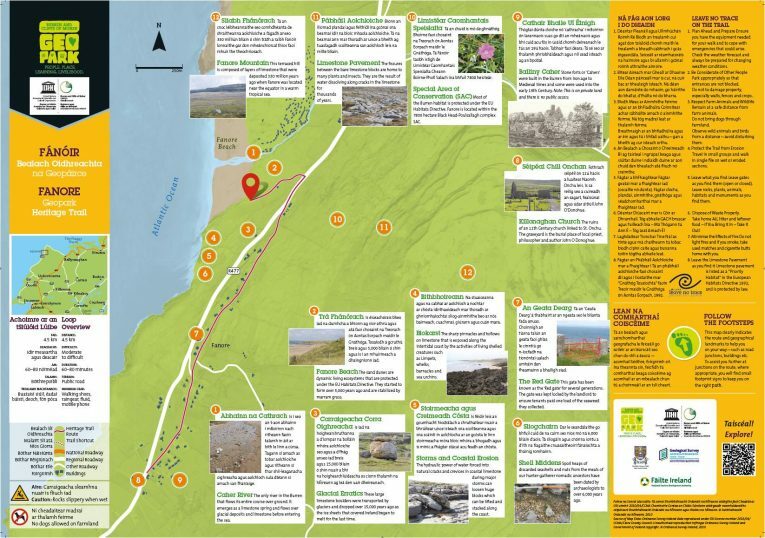 This small area of land between the sea and the road has been enhanced by the local community through the installation of a bird hide, interpretative board and picnic benches. Out to sea are the mud flats of the Rine and clusters of rocks known as Black Island and Farthing Rocks. Watch out for seals sunning themselves on the rocks, a huge variety of birds and the Martello Tower at Finavarra Point on the far horizon. 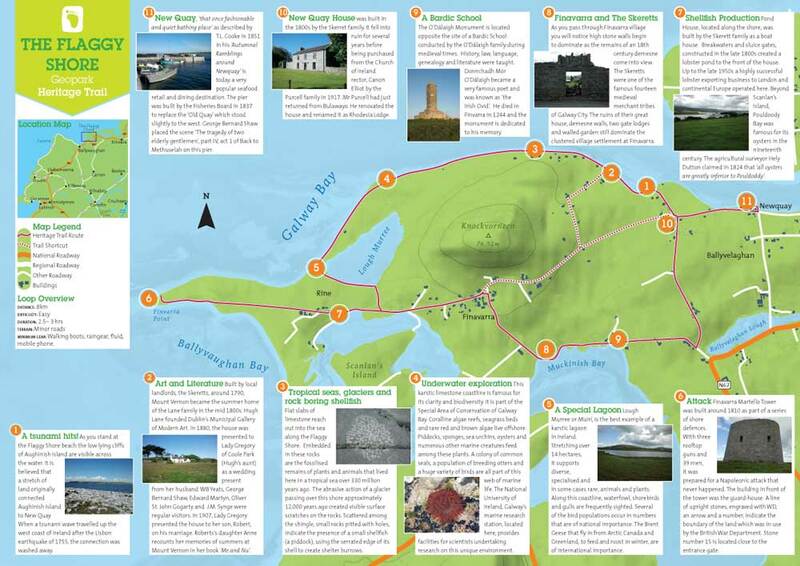 You can learn more about this tower on the Flaggy Shore Geopark Heritage Trail. A stone castle, which belonged to the O’Loghlen family, chieftains of the Burren, once stood on the small promontory opposite the entrance to the ‘Rent-an Irish cottages’ complex. The remains of a stone quay, adjacent to the promontory, may be medieval in origin and related to the castle. In 1569, Sir Henry Sydney’s forces attacked the O’Loghlens and the castle was destroyed. Ballyvaughan was a pilot area for the ‘Rent an Irish Cottage Scheme’ which started in the late 1960’s. Proposed by Shannon Development and supported by Clare County Council the cottages were developed under the Village Renewal scheme. Built between 1874 and 1881, Bournapeaka pier, facilitated the growing herring fishery and oyster production industries of the region. Grain, bacon and vegetables were exported and turf imported from Connemara. Still referred to today as the “New Pier”, it was extended in 2005. Beyond the ‘New Pier’ are a series of rubble stone landing places possibly dating to the 18th century or earlier. These were likely to have been used for seaweed harvesting and fish landings. One is known locally as The ‘Girls Quay’ and its proximity to the 19th century Clareville House, suggests that it may have served as a bathing place for the ladies of the house. (now O’Loghlens Bar) featured in many nineteenth century guide books. ‘The principal hotel is on the shore, and in our experience it is well conducted, and one can be made comfortable in it, as we ourselves experienced when staying under its roof. A steamer plys between Galway and Ballyvaughan, taking passengers to and from Lisdoonvarna, and excursions are made also to the Arran Islands from it and from Galway’. Holiday Haunts on the West Coast of Clare (1891). The former weigh bridge, which was used to weigh goods for sale is located adjacent to O’Loghlens Bar. In 1872, Lord Annaly built a water reservoir outside Ballyvaughan to serve the farming community. The scheme was extended to Ballyvaughan village under the Public Health Act of 1874. This fountain was erected in 1875 by two Connemara stonemasons, the Coyne brothers, who were marooned in Ballyvaughan when their craft sank at Gleninagh pier. A number of plaques on the fountain record the names of those involved in providing Ballyvaughan with one of the earliest reliable public water supplies in the country. In 1841, Ballyvaughan had 235 inhabitants, living in 35 houses. Most supplies came from Galway and the inhabitants exported their grain, bacon and vegetables from the quay. The village had its own courthouse, workhouse, coastguard station and a large police barracks at this time. As you turn onto the main street in Ballyvaughan, the building that today houses Quinn’s shop was a former constabulary barracks in the 1840s. The courthhouse was located in the building opposite Logues Lounge. The original village national school, built in 1854, was restored and officially opened as a community hall by President Mary Robinson in 1992. A weekly farmers market and craft fair are held here throughout the summer months and during the Christmas season. To provide relief for the poor during the Famine of the 1840s, an auxiliary workhouse operated in the low cut-stone buildings located at the end of this short lane. In 1847, Ballyvaughan Poor Law Union was established and in 1852 a larger workhouse, designed to accommodate 500 inmates, was built. The site of this workhouse is located to the rear of the present day National School along the Ballyvaughan Wood Loop Walk (trailhead at quay). The foundation stone for this Gothic-style Roman Catholic Church was laid by Bishop Fallon in 1858. Knocked by storms in both 1862 and 1863, Fr. Forde collected donations locally and in Australia and by 1866 the church had been rebuilt. In 1938 a marble altar and communion rail were added and the walls and floor of the sanctuary were finished in mosaic. In 1942 a general renovation of the nave, roof and tower were carried out. The roof was replaced in 1985. Lisdoonvarna and its Spa Waters Three small rivers flow through Lisdoonvarna, the Aille, Gowlaun and Kilmoon, all in deep ravines. Each has broken through the upper layer of shale and now flows on top of the underlying limestone. The shales are rich in phosphate, iron sulphide, calcium carbonate and organic matter. Where the shale meets the limestone, there is a layer particularly rich in phosphate and a number of mineral springs discharge from the shale at this point. The town of Lisdoonvarna developed around these natural spring wells, famous for their health-giving sulphur water and they became a major spa tourist attraction in the 19th century. Lisdoonvarna is nestled within a landscape of rounded hills of shale rock. This shale was formed approximately 300 million years ago when clay sediments settled on the bed of a deep dark sea. Underneath this shale rock is the limestone, that is visible on the surface further north in the Burren. Unlike limestone, shale is not dissolved by water and the rivers flow on the surface. However, because the shale is made from clay particles it breaks and chips easily. Flowing to the left of the trail is the River Aille. The river has dug into the shale over the centuries and created a deep ravine. Walking along the trail, you are surrounded by vegetation which prefers wet conditions. This reflects the impervious nature of the underlying shale which often causes water logging on the surface when drainage is impeded. Rushes, horsetails, willow herb, ragged robin and sedges grow among the grass of the parkland. The trees that line the ravine of the Aille River include birch, alder, willow, sycamore, scots pine and oak. On the opposite side of the ravine the rounded hills are covered by bog vegetation, including sphagnum mosses, black bog rush, sedges and furze. Descending the steps, you are passing through the shale layer to where the Aille River has reached the underlying limestone. In a short space of time, you have climbed down through approximately 20 million years of geological history. At the bottom of the steps are the ‘Twin Wells’. Discovered in the mid-1700s, these wells are a source of chalybeate and magnesia and unusually the two separate wells spring from the same rock. Due to the popularity of the wells in the 1800s, steps were made down from the road above in 1870. An attendant working at the Twin Wells in 1908 earned 10 shillings (60 cent) a week. Ascending the steps to rejoin the trail, a second river flows in the ravine to your left. This is the Kilmoon stream which is flowing to meet the Aille River near the Twin wells. All along the banks of the Kilmoon Steam, large trees line the banks. Beech, horse chestnut, sycamore, ash, alder and willow adorned with mosses and lichens are underlain with a shrub layer of holly, hazel, hawthorn, elder, blackthorn and ivy and a colourful ground layer of speedwell, herb robert, cross stitch, celandines and ferns. Continuing straight along the trail, passing to the rear of the Burren Salmon Smokehouse, you reach a pedestrian entrance gate to the park. On the opposite side of the road is the Town Library, housed in the former Pump Room of the ‘iron and magnesia wells’ of the Kilmoon stream. It was recommended that people first took a course of magnesia before taking the iron water. The magnesia water was said to be beneficial for those with ‘weak stomachs’, while the iron water was used as a blood tonic and particularly recommended to ‘young and weak females’. Returning back into the park through the pedestrian gate and along the path, turn left where the trail divides. The Pavilion was built in 1913 on land acquired for a park and recreation area. Mr Roughan of Ennistymon laid the foundation at a cost of £210 and Humphreys of Dublin constructed it at a cost of £1114, with steel from Harland and Wolff of Belfast. Lit by gas, with a maple floor and seating for 1,000 people it became a venue for theatre, dance and general entertainment. Eamon de Valera addressed a crowd of 3,000 people in the Pavilion on 30 July 1917 as part of his election campaign. 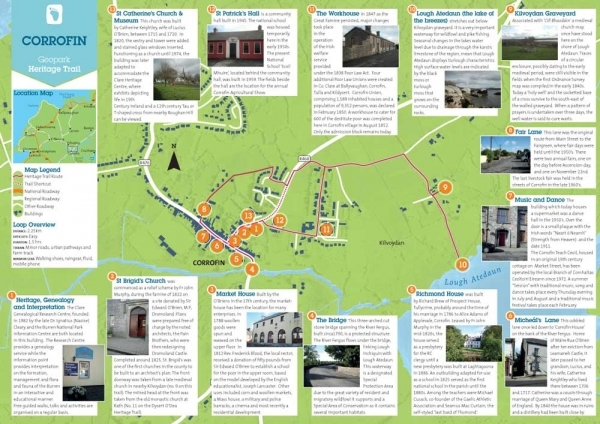 Today, managed by the Lisdoonvarna Fáilte Development Group it remains a successful centre for varied activities set within a well developed activities park. Leaving the grounds of the Pavilion, cross to the opposite side of the road, continue over the bridge and turn left into the park. Close to the bridge the Gowlaun River joins the Aille. According to local information, sulphur springs were discovered on the Gowlaun River in the early 1700s when a man out hunting was assailed by the strong smell of ‘rotten eggs’. The smell came from hydrogen sulphide gas which is released from the sulphur rich spring waters. Analysed in 1713, the springs contain large quantities of sulphur and iron. In 1867 Capt. Stacpoole, the landlord, built two small houses over the Gowlaun wells and installed a pump. In 1875 the first bath house was constructed here. By 1878 over 5,000 visitors were recorded. The existing bath house was built between 1939 and 1945. As you stand at the Flaggy Shore beach the low lying cliffs of Aughinish Island are visible across the water. It is believed that a stretch of land originally connected Aughinish Island to New Quay. When a tsunami wave travelled up the west coast of Ireland after the Lisbon earthquake of 1755, the connection was washed away. Built by local landlords, the Skeretts, around 1790, Mount Vernon became the summer home of the Lane family in the mid 1800s. Hugh Lane founded Dublin’s Municipal Gallery of Modern Art. In 1880, the house was presented to Lady Gregory of Coole Park (Hugh’s aunt) as a wedding present from her husband. WB Yeats, George Bernard Shaw, Edward Martyn, Oliver St. John Gogarty and J.M. Synge were regular visitors. In 1907, Lady Gregory presented the house to her son, Robert, on his marriage. Roberts’s daughter Anne recounts her memories of summers at Mount Vernon in her book ‘Me and Nu’. Flat slabs of limestone reach out into the sea along the Flaggy Shore. Embedded in these rocks are the fossilised remains of plants and animals that lived here in a tropical sea over 330 million years ago. The abrasive action of a glacier passing over this shore approximately 12,000 years ago created visible surface scratches on the rocks. Scattered among the shingle, small rocks pitted with holes, indicate the presence of a small shellfish (a piddock), using the serrated edge of its shell to create shelter burrows. This karstic limestone coastline is famous for its clarity and biodiversity. 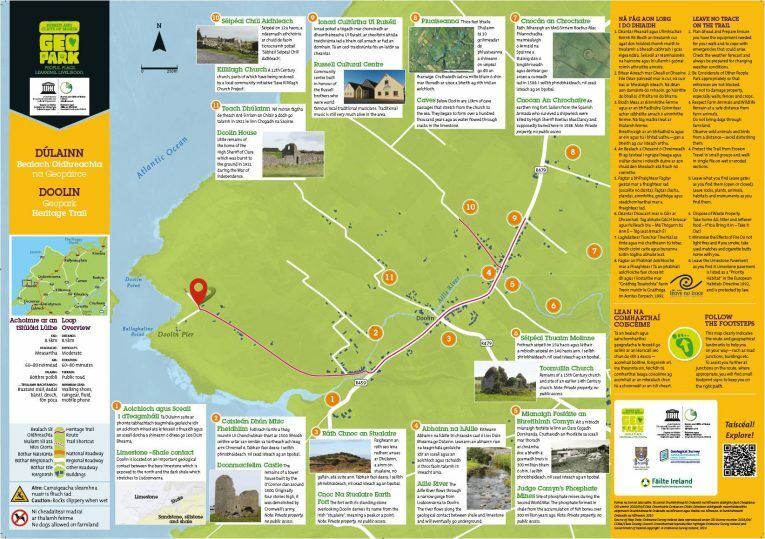 It is part of the Special Area of Conservation of Galway Bay. Coralline algae reefs, seagrass beds and rare red and brown algae live offshore. Piddocks, sponges, sea urchins, oysters and numerous other marine creatures feed among these plants. A colony of common seals, a population of breeding otters and a huge variety of birds are all part of this web of marine life. The National University of Ireland, Galway’s marine research station, located here, provides facilities for scientists undertaking research on this unique environment. Lough Murree or Muirí, is the best example of a karstic lagoon in Ireland. Stretching over 14 hectares, it supports diverse, specialised and in some cases rare, animals and plants. Along this coastline, waterfowl, shorebirds and gulls are frequently sighted. Several of the bird populations occur in numbers that are of national importance. The Brent Geese that fly in from Arctic Canada and Greenland, to feed and roost in winter, are of international importance. Martello Tower was built around 1810 as part of a series of shore defences. With three rooftop guns and 39 men, it was prepared for a Napoleonic attack that never happened. The building in front of the tower was the guard-house. A line of upright stones, engraved with WD, an arrow and a number, indicate the boundary of the land which was in use by the British War Department. Stone number 15 is located close to the entrance gate. Pond House, located along the shore, was built by the Skerett family as a boat house. Breakwaters and sluice gates, constructed in the late 1800s created a lobster pond to the front of the house. Up to the late 1950s a highly successful lobster exporting business to London and continental Europe operated here. Beyond Scanlan’s Island, Pouldoody Bay was famous for its oysters in the nineteenth century. The agricultural surveyor Hely Dutton claimed in 1824 that ‘all oysters are greatly inferior to Pouldoddy’. As you pass through Finavarra village you will notice high stone walls begin to dominate as the remains of an 18th century demesne come into view. The Skeretts were one of the famous fourteen medieval merchant tribes of Galway City. The ruins of their great house, demesne walls, two gate lodges and walled garden still dominate the clustered village settlement at Finavarra. The O’Dálaigh Monument is located opposite the site of a Bardic School conducted by the O’Dálaigh family during medieval times. History, law, language, genealogy and literature were taught. Donnchadh Mór O’Dálaigh became a very famous poet and was known as ‘the Irish Ovid’. He died in Finvarra in 1244 and the monument is dedicated to his memory. was built in the 1800s by the Skerret family. It fell into ruin for several years before being purchased from the Church of Ireland rector, Canon Elliot by the Purcell family in 1917. Mr Purcell had just returned from Bulawayo. He renovated the house and renamed it as Rhodesia Lodge. ‘that once fashionable and quiet bathing place’ as described by T.L. Cooke in 1851 in his ‘Autumnal Ramblings around Newquay’ is today a very popular seafood retail and dining destination. The pier was built by the Fisheries Board in 1837 to replace the ‘Old Quay’ which stood slightly to the west. George Bernard Shaw placed the scene ‘The tragedy of two elderly gentlemen’, part IV, act 1 of Back to Methuselah on this pier.